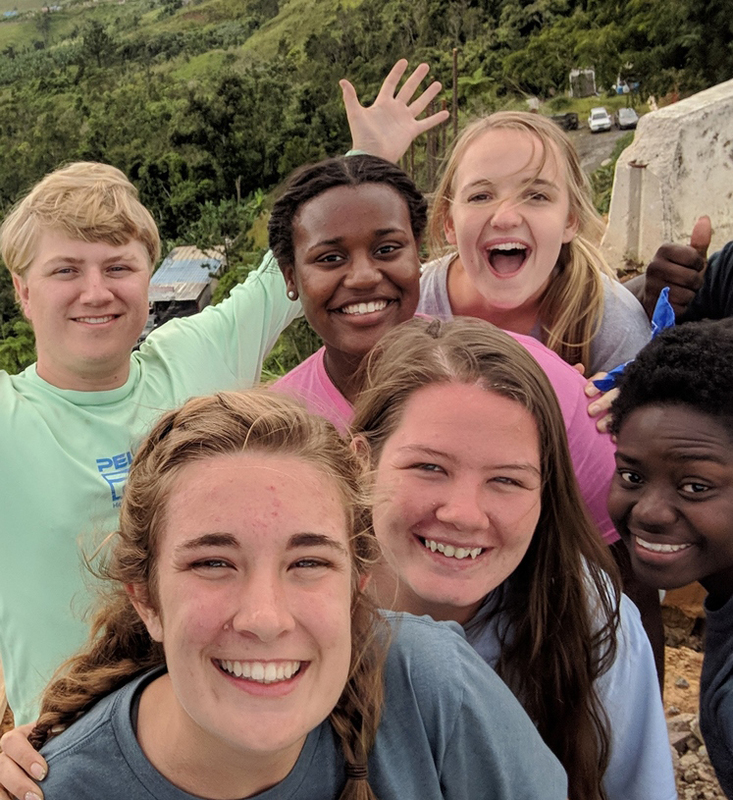 Ten CIU students, along with Intercultural Studies Professor Michelle Raven, travelled to Puerto Rico in October to assist the people there who continue to recover from Hurricane Maria that hit the U.S. territory a year ago. Below are the reflections of a member of the CIU recovery team, Joanna Railey, discussing the six days of ministry. She is a sophomore majoring in Intercultural Studies. Puerto Rico is a breathtakingly beautiful country. The mountains that roll on into eternity and the small cities nestled in the valleys made me feel at home. The sun hits the hills in the morning and evening in a way that makes everything around you light up with golden light. It brings a peace that is hard to explain unless you experience it yourself. Among all of this beauty and peace however, there is a lot of destruction. Hurricane Maria hit Puerto Rico about a year ago and many homes were destroyed and lives were taken. The stark contrast between beauty and destruction is an interesting thing to witness. Right beside wonderful views, there are houses without roofs or trees stripped of their branches. We came specifically to reconstruct the home of a woman named Magaly and pray and minister to her community, the town of Aibonito. Through this I was able to see a special kind of beauty in the hearts of the people. Even though they had little, they gave in abundance out of the gratefulness of their hearts. I learned from them what valuing the image of God in another country truly looks like. They loved and supported others not because of what they could bring or who they were, but because they are people. They took care of others as family. It was a privilege to help this community. While we built a home and fed a community, the people of Puerto Rico gave us so much more. They welcomed us into their homes without question, they loved complete strangers, and encouraged our team even more than we could encourage them. There were moments for conversation where we explained why we were there, shared our stories, heard their stories, and exchanged encouragement. I learned that our simple presence in Aibonito was an enormous gift to the community. We were able to share with them that they were not forgotten and the reason why we were in Puerto Rico in the first place. We loved because of the love that Jesus Christ gave us. I was able to take the beauty of Puerto Rico home with a new perspective — loving people simply because of the image of God placed in them. Where is God leading you to serve? Check out CIU’s undergraduate, graduate, seminary and online programs. Excitement is building on the CIU campus with a dramatic increase in enrollment and on-campus expansion. Information on enrollment is available here or call (800) 777-2227, ext. 5024.